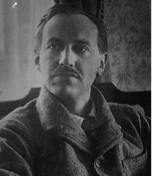 Edward Plunkett, more often known as known as Lord Dunsany, the 18th Baron of Dunsany, was an Anglo-Irish poet, short story fantasy writer and playwright. His literary output was considerable with over 80 books published. Arguably his most famous work was the fantasy novel, written in 1924, called The King of Elfland’s Daughter. His fame spread to such a degree that, during the early years of the 20th century, he was considered to be amongst the very best writers in the English-speaking world. He was born Edward John Moreton Drax Plunkett on the 24th July 1878 in London, which was where he spent his formative years. His family title goes right back to the middle of the 15th century, and is the second oldest in the history of the Irish peerage. His father, the 17th Baron Dunsany, died when Edward was 22 and so the title was passed on. He was fortunate to be born into such an influential family with connections in many fields such as literature, politics, the church and exploration. They had grand homes in England and Ireland and, despite not being in the same place for too long, Edward received a good education. He went to school at Cheam and then Eton College, before enrolling at the Royal Military College, Sandhurst in 1896. Dunsany probably spent a good deal of his early years at the Irish family seat near Tara called Dunsany Castle and it was here that he fell under the literary influence of William Butler Yeats amongst others. He was also fortunate to marry a woman who was fully supportive of his writing. Lady Beatrice Child Villiers became his wife in 1904 and she rendered great assistance to her husband, typing up his manuscripts and taking charge of his body of work after his death. Dunsany was a prime mover in the Irish Literary Revival which came to prominence at the end of the 19th and beginning of the 20th centuries. He was not just a writer though. He played sports such as football and cricket to a very high level and he was an expert horse rider and champion pistol shooter. Much less physical pursuits were also enjoyed, such as setting chess puzzles for publications such as the London Times newspaper. Understandably he was also a formidable chess player. He supported worthy organisations such as the Royal Society for the Prevention of Cruelty to Animals and the Boys Scouting Organisation. He had made Kent his home from the 1930s onwards and a near neighbour was Rudyard Kipling who became a good friend. Like Kipling, Dunsany was a prolific writer and there are two oddities about his writing that are worth mentioning. He seemed to be most comfortable if he was sitting at his desk with a crumpled, white hat beneath him. This artefact survived him but, was unfortunately stolen as a souvenir by a visitor to Dunsany Castle. The other was that he made his own quill pens and used them to write his ideas down. Edward Plunkett, Lord Dunsany died on the 25th October 1957 at the age of 79 after suffering from an acute attack of appendicitis at a dinner party in Dublin. His work lived on, Lady Dunsany ensuring that his literary legacy was passed on to his descendants and that his work could be read and enjoyed by everyone.